I love meatballs. I even learned Italian to get up close and personal with meatballs. This is a working class dish in Italy, with stale bread ground into crumbs added to the meat to increase the volume while keeping the cost in check. 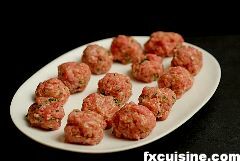 American meatballs are very special and unlike those found in the Italian peninsula. In America, a very traditional way of preparing this is spaghetti with meatballs. Here is a hybrid rendering with meatballs in ragù sauce just like in Italy but served with linguine, a sort of fat flat spaghetto. 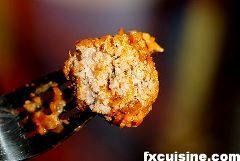 In Naples meatballs are used with maccheroni. Your bread needs to be stale and if possible rock hard so that you can turn it into crumbles in a mortar and pestle or mixer. 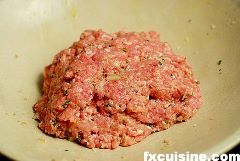 Add a little milk to turn these dry crumbs into a sticky cement that will become part of the meatballs without having them fall apart. 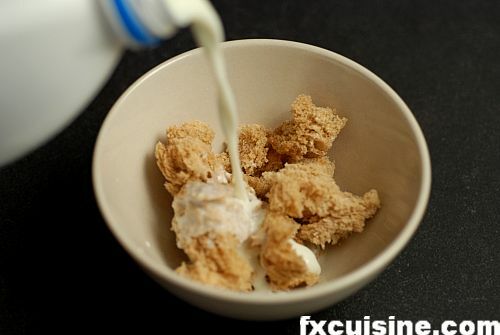 alternatively, if you don't have very stale bread use day's old bread cut in little cubes and leave it soak in the milk for 10 minutes. 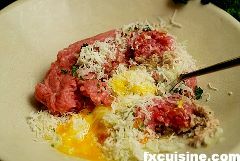 I recommend you then chop the wet bread finely so that it won't show up in the meatballs. 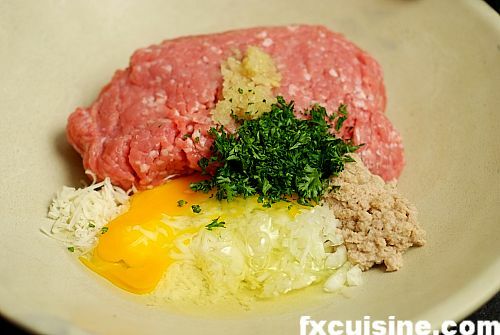 Clockwise from the top: ground meat, crushed garlic, finely chopped parsley, wet bread crumbs, onion, egg, grated cheese. 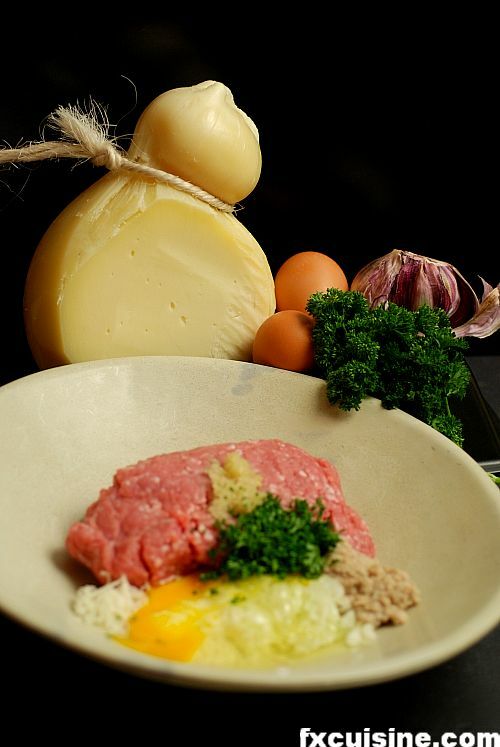 Mix with a fork or with both hands until you have a smooth, homogeneous paste. 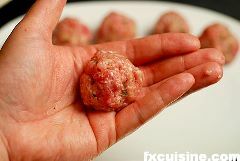 With your hands shape walnut-sized meatballs. 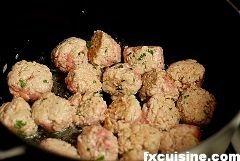 Fry the meatballs in a large frying pan in 2 tbsp olive oil until they are white all over and pale brown patches start to appear. Cover and reserve. To follow Neapolitan tradition I prepared a simple Neapolitan ragù, much quicker to make than the real thing. In Naples it would be called ragù finto - 'pretend ragù'. 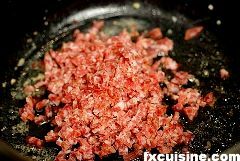 In a large Dutch oven fry a finely chopped dry sausage or pancetta. 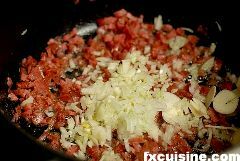 Add the chopped onion and garlic and leave to color for about 5 minutes. 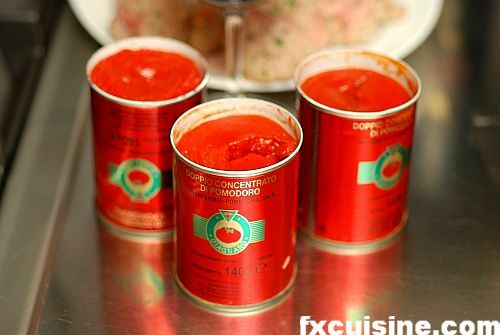 Prepare your tomato concentrate (yes it comes in cans, called buat in Napoli) and a jug of water next to your Dutch oven. 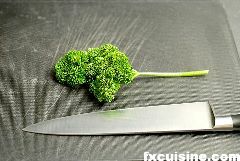 Add the tomato concentrate little by little (ideally one tablespoon at a time), mix well and let it turn dark brown. Add a glass of water, mix everything and let the mixture bubble over high heat, adding a little more concentrate. Let it turn dark too before adding water again. Proceed like this until you run out of concentrate, then add the meatballs and a 2 glasses of water, cover and let it simmer over low heat until the pasta is ready but if possible at least 1 hour. 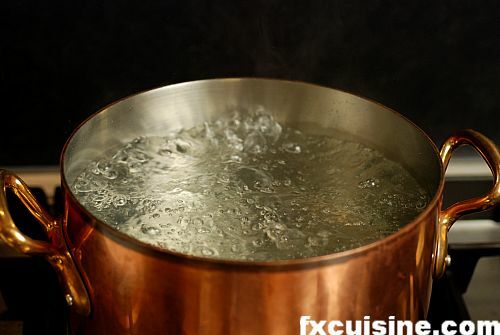 Fill your largest pot with water, add 2 tbsp salt and bring it to a rolling boil over your hottest burner. 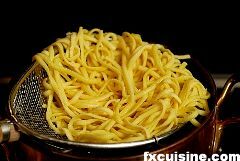 Boil your pasta - here I used homemade linguine but you can use bought spaghetti. Heat the plates and serve a generous laddle of sauce and meatballs over the pasta. 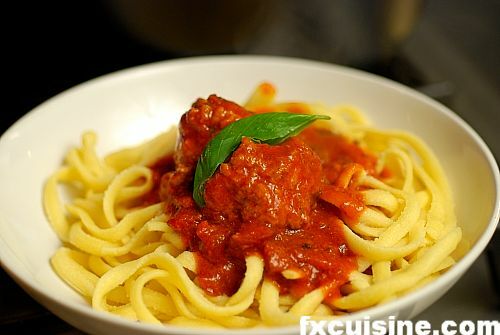 Spaghetti with meatballs, an American recipe for meatball lovers, at last prepared like real meatballs should.